The best way to show bankers, venture capitalists, and angel investors that you are worthy of financial support is to show them a great business plan. Make sure that your plan is clear, focused and realistic. Then show them that you have the tools, talent and team to make it happen. Your business plan is like your calling card, it will get you in the door where you’ll have to convince investors and loan officers that you can put your plan into action. Not everyone who starts and runs a business begins with a business plan, but it certainly helps to have one. If you are seeking funding from a venture capitalist, you will certainly need a comprehensive business plan that is well thought out and contains sound business reasoning. If you are approaching a banker for a loan for a start-up business, your loan officer may suggest a Small Business Administration (SBA) loan, which will require a business plan. If you have an existing business and are approaching a bank for capital to expand the business, they often will not require a business plan, but they may look more favorably on your application if you have one. Do You REALLY Need to Prepare a Business Plan? Executive Summary–features the highlights of your plan and sells your idea in two pages or less. Company Summary–a factual description of your company, ownership, and history. Products (or Services or both)–describes your products and/or services and how they stand out from competitive products and services. A professional consultant will create the business plan for you, but you still have to be prepared to think through your business and understand the underlying concepts in your business idea. You will have to work closely with the consultant to ensure that he or she develops a good plan that accurately represents your business or business idea. 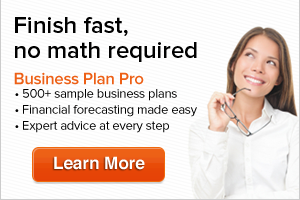 You can find a list of business planning consultants at www.planconsultants.com. A good business planning software package will provide you with an outline for a well-developed, objective-based and professional business plan. Software packages will remove the problem of starting from scratch by structuring your plan for you. The software should ask you the right questions that will pull out the most important underlying concepts within your business idea.